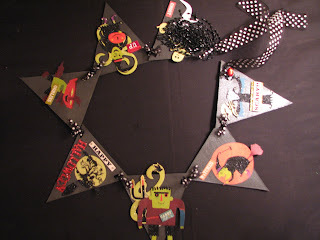 I received my Sweet & Sinister Swap from my swap partner, Sherri. I just love the sweet glittery banner that she made. It already has a special place in my house hanging from my step back cabinet. 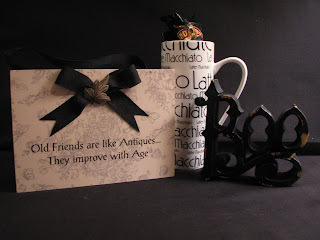 She also included a Boo, a beautiful friend's plaque and a mug with cocoa. What sweet and beautiful things that Sherri bestowed upon me. Thank you Sherri for all the beautiful and thoughtful gifts they will be treasured! Sweet banner!!! The Sweet & Sinister swap is a reminder of when we first met on-line, so Happy one year of friendship..LOL! this is the 2nd year in a row I missed out on being in that swap! And it looks like such a fun one. Sorry you can't come to craft day this week, we'll try to figure out a date in the future when we can get together.